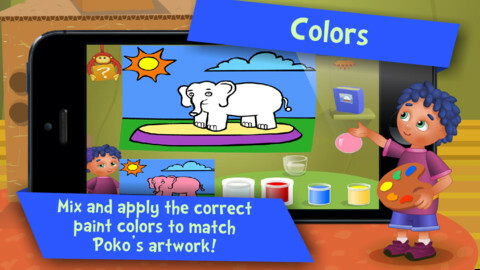 iLearn with Poko:Emotions, Feelings and Colors! is an iPad app developed by Tribal Nova. Part of the “i Learn With” suite of apps, this kid-friendly app will please parents and children alike. This app is targeted at kids who are of age to be in pre-school or kindergarten. Charming characters named Poko, Bibi and Minus help your children learn about emotions through a series of short animated stories. 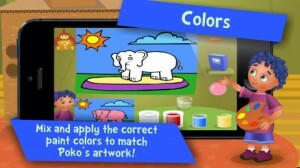 There’s also a painting component, which will help kids feel creative and happy. One of the coolest features in Emotions, Feelings and Colors! is the personalized tracking system. This allows parents to monitor the individual progress of their child as they use the app. Detailed success stats for your child can be compared with children the same age to further judge their progress. The kids who use this app will learn about problem solving and critical listening. Kids can have a hard time expressing themselves, and this app can help kids to open up. Free to download and just $2.99 to unlock fully, Emotions, Feelings and Colors! can help young kids to access their feelings and have fun at the same time. With 18 fun rewards and medals to motivate your child to learn, Emotions, Feelings and Colors! is a great app for Pre-K kids. 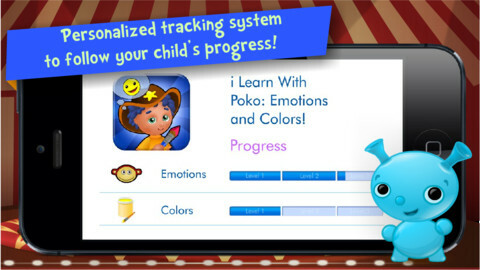 iLearn with Poko:Emotions, Feelings and Colors!is compatible with iPhone 3GS, iPhone 4, iPhone 4S, iPhone 5, iPod touch (3rd generation), iPod touch (4th generation), iPod touch (5th generation) and iPad. Requires iOS 4.3 or later. This app is optimized for iPhone 5.